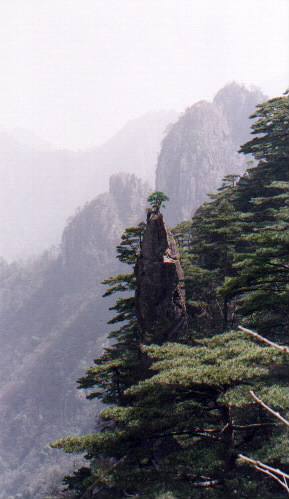 Huangshan is the most famous mountain in China. 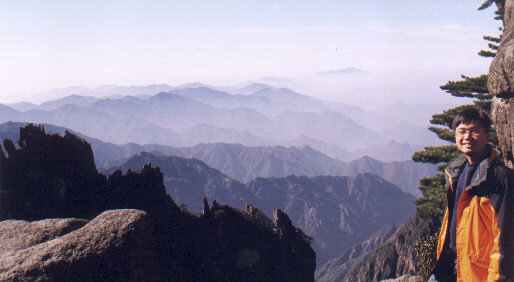 It is composed of many peaks with special characteristics. It is so beautiful that one should go there at least once in his/her lifetime. I went there twice. I recommend the following schedule which includes all the main sight seeing areas in the region. After arriving in Huangshan, take time to spend half-day in Yungu Hotel(云谷山庄), where there are excellent Huangshan food provided in its Chinese restaurant. Take the cable car of Yungu Telpher , in order to go to the White Goose Range Stop. Walk to Beihai Hotel (北海賓館)and check in . 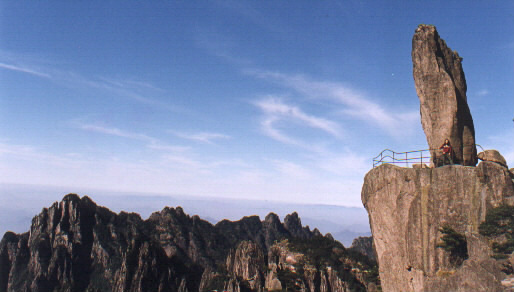 Put your backpack there and then take a lunch before you go out again to explore the beauty at the eastern side of Huangshan. Go back the road that you walked to Beihai Hotel. You can recognize a "brush pen" like rock . On the top of the rock , there is some vegetation. It is the famous " Flower Grown out of a Writing Brush Rock"
Go back to Beihai Hotel and take a rest. 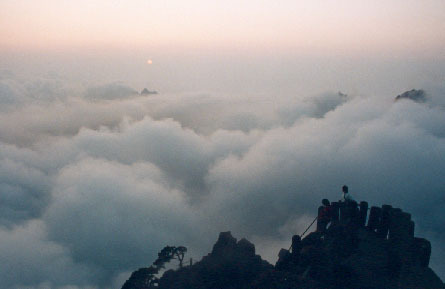 Then you must not miss the chance of seeing the very attractive sunset at Cloud Dispelling Pavilion (排云亭). It is situated at the western side of Beihai Hotel. You need to take a 30-45 min walk to go there. After seeing the sunset, go back to Beihai Hotel for a big hot meal! Get up very early and walk to the Refreshing Terrace (清涼台)to see the sunrise. You will see the postcard picture of " A Monkey Watching the Sea" there. Don't you see the small monkey standing on the platform on the left side of the photo? Begin the trekking after taking a breakfast. Walk along the route as shown on the map. You will notice great mountain views. 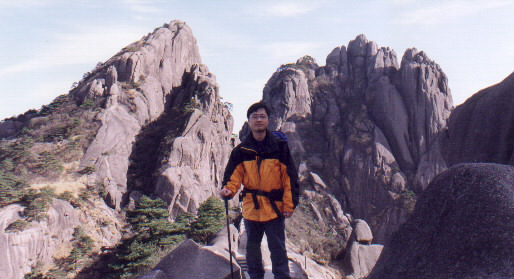 You may think that you are at the top of the world when you are standing on Bright Top Peak(光明頂). You will pass through the Tian Hai Region where you can a light meal (lunch) there. 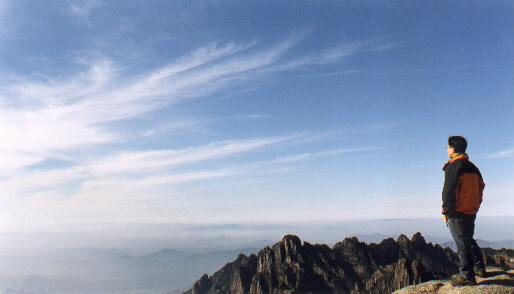 Continue your trekking and you will meet the Lotus Peak (蓮花山) and Lotus Stamen Peak. 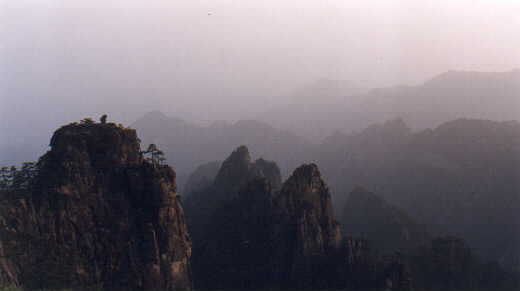 When you reach the site called Jade Screen(玉屏), you can see Celestial Capital Peak which is at the east. Get up in the morning; walk down the path and you will see "Three Islands at Penglai". Soon afterwards, you will get to the entrance of Celestial Capital Peak(天都峰). The entrance is not open always. It is locked in bad weather , snow season and other time when the authority thinks that it is dangerous to climb up. I have to tell you the steps are very steep when you get up there. Prepare yourself psychologically when you want to do so. While you are climbing up, take a look back to the Jade Screen. You will see the following picture. Now you may understand why it is called as the Jade Screen. You can recognize the small house build on the top of the magnificent Jade Screen. Some local people said: You got nothing if you didn't go up Celestial Capital Peak. This saying has some truth in it. 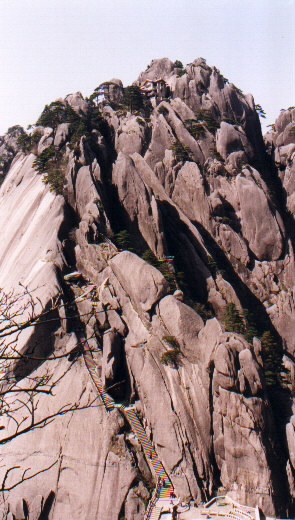 Before you get the very crest of Celestial Capital Peak, you have to overcome The Carp's Backbone(鯉魚背) which is very narrow footpath built on "razor blade" of a giant rock. 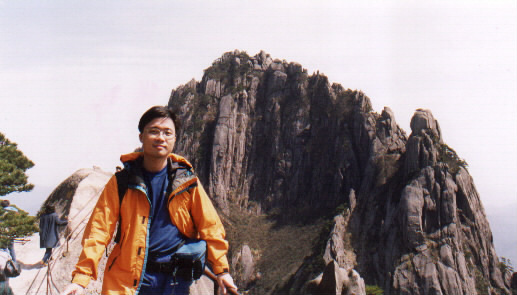 In good weather (especially with surrounding clouds) , the view from the top of Celestial Capital Peak is so great. You may imagine that you were like angels, flying in the heaven. After satisfying yourself at the top of the Celestial Capital Peak, take time to go back to the Jade Screen Hotel to pick up your backpack . 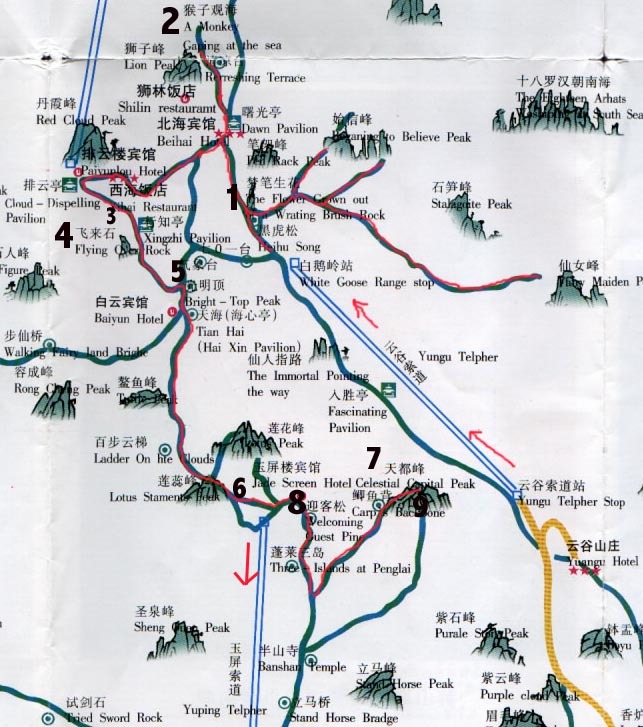 Then go to the station of Yuping Telpher, where you can take a cable car to descend to Mercy Light Temple and leave. If you have time, it would also be a very good idea to pay a visit to the amazing Walking Fairy Land Bridge(步仙橋). It is a elegant stone bridge built across two huge rock tower.